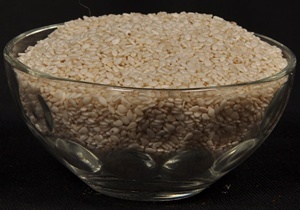 Sesame seeds is used as toping agent in bakery products.Sesame oil is used for cooking purpose. Sesame Seeds is also used in food processing industry, pharmaceutical industry, ayurvedic medicines. Sesame (Sesamum indicum) is a flowering plant in the genus Sesamum. Numerous wild relatives occur in Africa and a smaller number in India. It is widely naturalized in tropical regions around the world and is cultivated for its edible seeds, which grow in pods.